So it is fairly easy to pass a parameter in Get method. It is passed via URL only so it can of type string only. Also, the REST Services exposed via GET method, can be called and Tested via browser. So to test it via browser, you should browse the complete URL (service url including method name or as URI defined while exposing). Here the method takes no parameter and returns a list of object of custom type. It is not as straight forward as above one. As we know that in the Post method the input is passed in body of request and that should be properly serialized as well. As we know that WCF uses it’s own serialization named as System.Runtime.Serialization so it should be used for serializing the input. If you are using XmlSerializer or other then you might face issue. 1- Create a HTTPWebRequest object with the provided REST service URL. 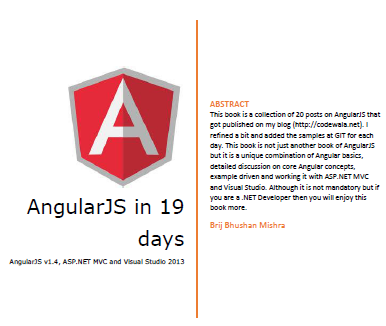 2- Provide the method type and Content Type to the request. 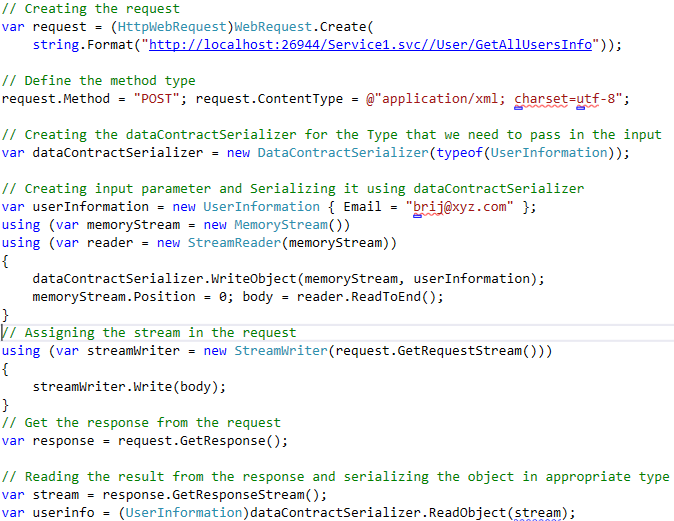 3- Create the input object and serialize it and then assign that stream the request. 4- Initiate the request and get response. Hope you all have enjoyed the post. Thank you all.